Making the workplace a safe environment is one of the top priorities of companies & organizations across Canada. Yet, despite the many safety precautions in place, accidents still occur and workers get injured. That’s why it is imperative that your staff know essential first aid in the workplace. Combined with awareness and quick thinking, these simple actions can help prevent accidents and injuries. 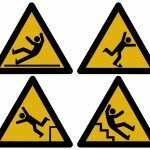 Most accidents and injuries in the workplace are aggravated further because of hasty decisions and actions made by co-workers. If you are present when an incident occurs, ensure that you remain calm and composed so you can make the best judgments and help the injured person. 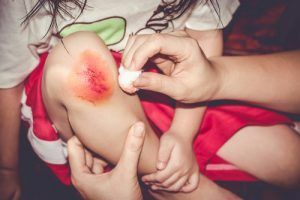 Each department should have at least one member who is trained in practical first-aid and designated as the person-in-charge when accidents happen. It is everyone’s responsibility to know who that person is so he/she can be notified immediately during emergency situations. If the situation involves severe bleeding, loss of consciousness, or head/back injury then call 9-1-1 right away. Before attempting to reach the injured individual, evaluate the area for any safety hazards. Look for any cluttered materials, spilled liquid, exposed power lines, or burning equipment. There might also be a hazardous chemical that shouldn’t be inhaled. Whether you are the first person to see the accident or the person-in-charge to respond, prioritize your own safety so you’ll be able to help the injured person. While waiting for help to arrive, try to make the injured co-worker feel comfortable as much as you can. Clear the scene of all equipment or bystanders that might be preventing good air flow to the area. If the person is conscious, make sure that he/she is breathing evenly. Talk to the person and keep him or her conscious until help arrives. If you see any bleeding, whether severe or minor, find a bandage or clean cloth and put it against the cut or wound. Apply direct pressure to help stop the bleeding and prevent the injured person from losing too much blood. Get more cloth to help contain the bleeding. If a foreign object is stuck in the wound, do not try to remove it. Continue applying pressure until help arrives at the scene. If the injured person is experiencing pain in the head, neck, or back; do not try to move him/her unless there is more imminent danger. Any numbness in the lower body might mean injury in the spine. This is a critical condition and any small movement may only worsen the injury. Keep the person in the same position and give protection from physical contact prevent with any object, equipment, or co-worker. A first-aid kit is vital to have on hand for a wide variety of emergency situations. Ensure that there’s one in your workplace and that everyone is aware of its location. 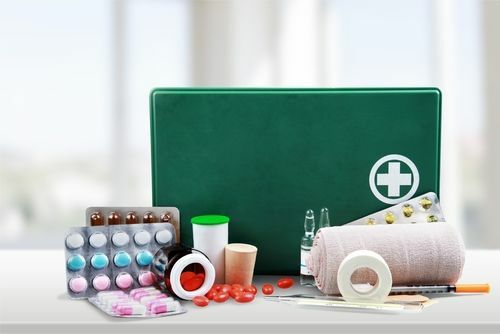 Stock and restock it with first-aid items such as band-aids, gauze, tape, large bandages & tourniquets, rubbing alcohol, cotton, disposable gloves, and over-the-counter medicines (ibuprofen, acetaminophen, aspirin, etc.). You can add other items which you think are appropriate to the type of workplace you are working in. 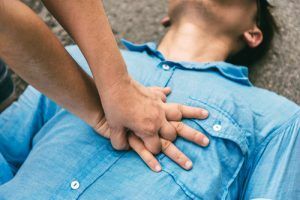 With these essential first aid tips in the workplace, you’ll be able to handle emergency situations well and mitigate or prevent any further harm. As they say, prevention is always better than cure. That’s why ensuring safety should always come first. Advanced Consulting and Training Ltd. can help. 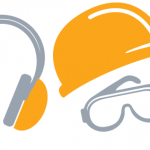 Contact us today to find out about our safety training programs that will help ensure a safe workplace.